Dining aboard the Taber is like eating in the relaxed company of welcoming friends at your favorite bistro. With our elevated fare, we delight in sourcing food locally, all while holding true to the robust flavors that attract foodies to Maine. All of your meals – including freshly baked breads and tempting pastries – are prepared on the galley’s vintage wood-burning stove. Breakfast lobster Benedict for those who don't get their fill during the lobster bake. If you’re an early riser, locally roasted coffee, tea, and a light pastry or quick bread will be awaiting you up on deck. Once breakfast is served, help yourself to the morning’s spread which changes daily – wild Maine blueberry pancakes, herb scrambled eggs, locally cured bacon, fresh fruit, always accompanied by our shipboard-made granola. Our steaming soups and stews come up from the galley's wood-fired stove and into your bowl. Lunch features hearty soups and chowders, freshly baked bread straight from the oven, satisfying salads, and sweet treats worth saving room for. We start by cracking open the evening’s red and white wines, hand selected by Jane Barnes to complement the culinary affair. To that, we indulge you in a spread of pre-dinner nibbles. Captain Noah is an acknowledged fromagophile, and he will have a selection of his favorites to share. The wine continues to flow as dinner is served. Seasonal vegetables from our local purveyor and herbs from Jane's garden accompany the meal. Decadent desserts round off the evening along with coffee and tea. With stunning panoramic views, we often linger long past sunset, sharing stories and songs by lantern and starlight. 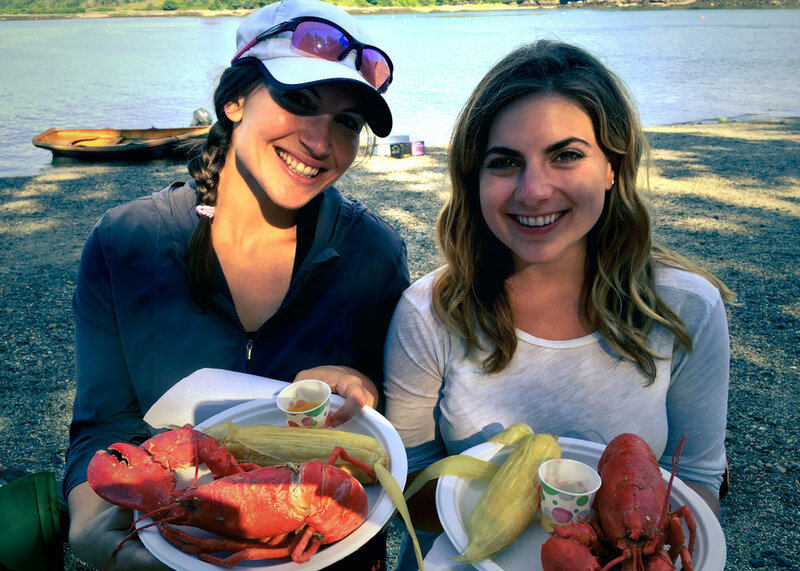 A culinary highlight of each trip is our traditional lobster bake, complete with grilled steak and chicken and corn on the cob, all cooked over an open fire and served, weather permitting, on a secluded beach. We rendezvous that day with a local lobster trapper for a fresh catch of Maine’s finest crustaceans. After coming ashore, you’ll have time to explore or just plain relax as we prepare the feast. Help yourself to our spread of crudités, chips and crackers, a variety of dips, fresh fruit, and cheeses. With the main fare we’ll come around with wines and anything else that’s missing from your plate. Our signature dessert comes last. You won’t want to miss out! 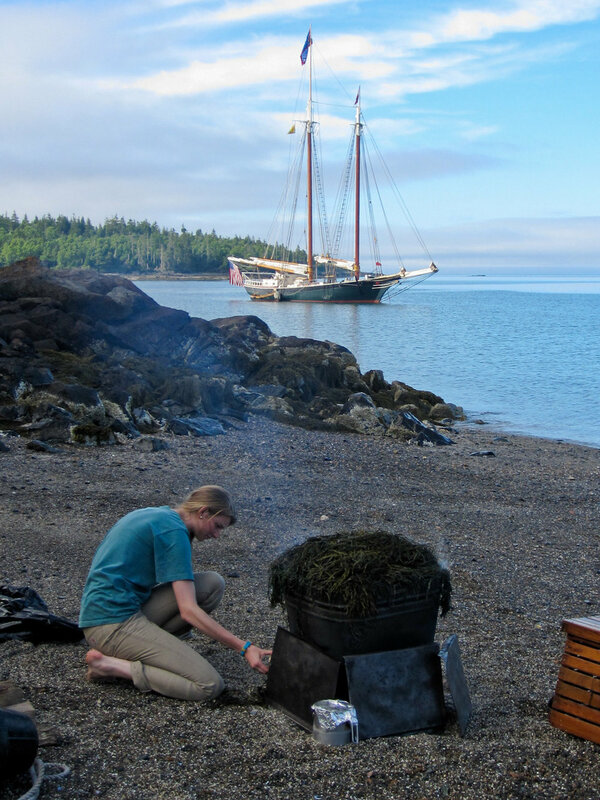 Keeping the fire stoked under the lobsters and corn on the cob as the Taber sits anchored off shore. It's an all-you-can-eat lobster feast, so don't be shy! The wines we serve each evening are all hand selected by Taber co-owner Jane Barrett Barnes. Jane has visited many vineyards throughout the world. 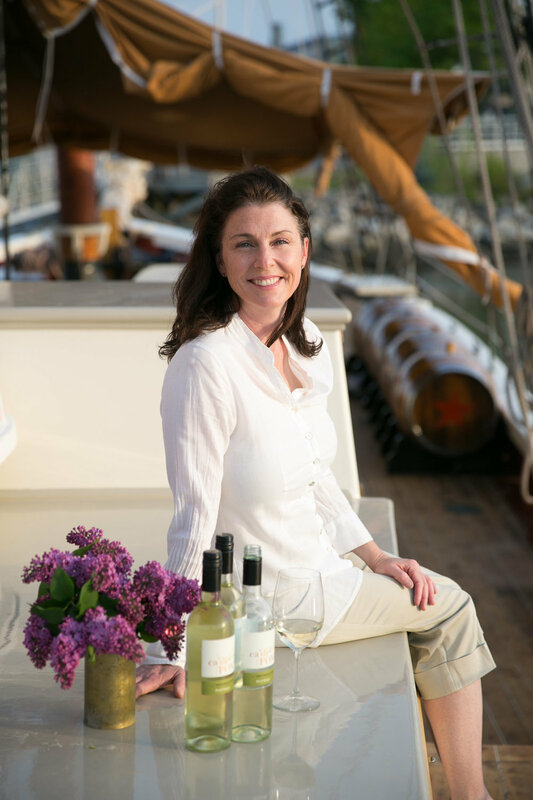 Her career has included such top industry leaders as Four Seasons, Champagne Veuve Clicquot, the International Wine Center, Joe Bastianich, and Terlato Wines.